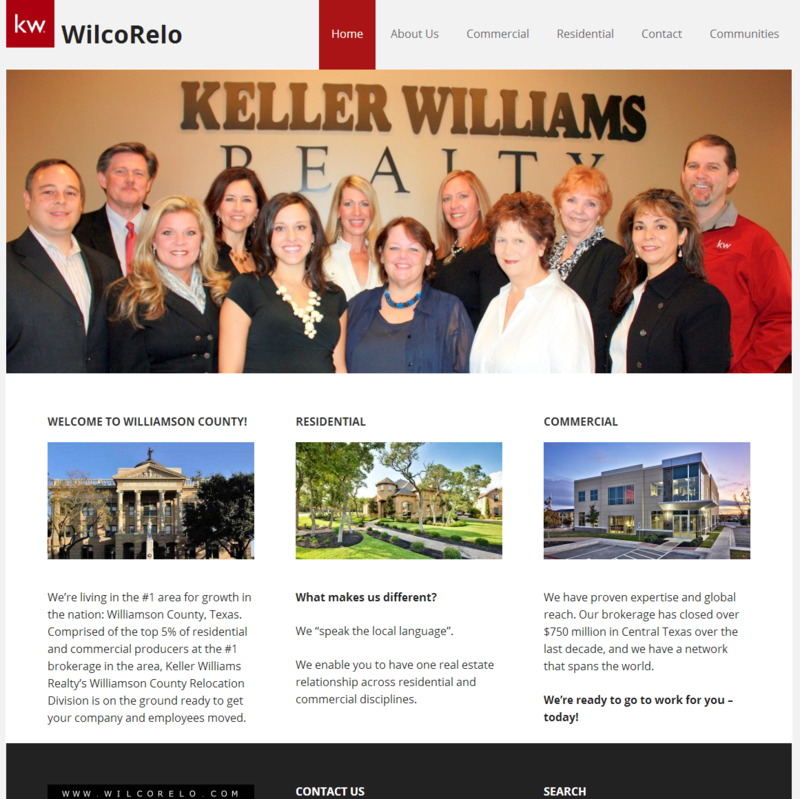 The Williamson County Relocation team at Keller Williams contacted us recently to build a new website to help them attract businesses and residents planning to move to the Williamson County area. They wanted a site that looked professional, was mobile responsive and had the ability for visitors to search properties directly from the site. The site you see here was the result of our efforts. It was built using the Executive Pro child theme and Genesis framework so it looks great on any device because it’s mobile responsive and uses the latest HTML5 markup. Visit the site at http://wilcorelo.com/. 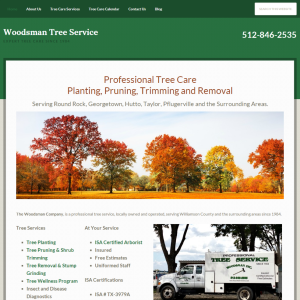 Roy from The Woodsman Tree Company contacted us a little while back to build a new website and help with their online marketing and search engine optimization. The first phase of our project with them included building the site you see here. Their new site was built using the latest Going Green Pro child theme and the Genesis framework. The theme chosen is mobile responsive and uses the latest HTML5 markup. 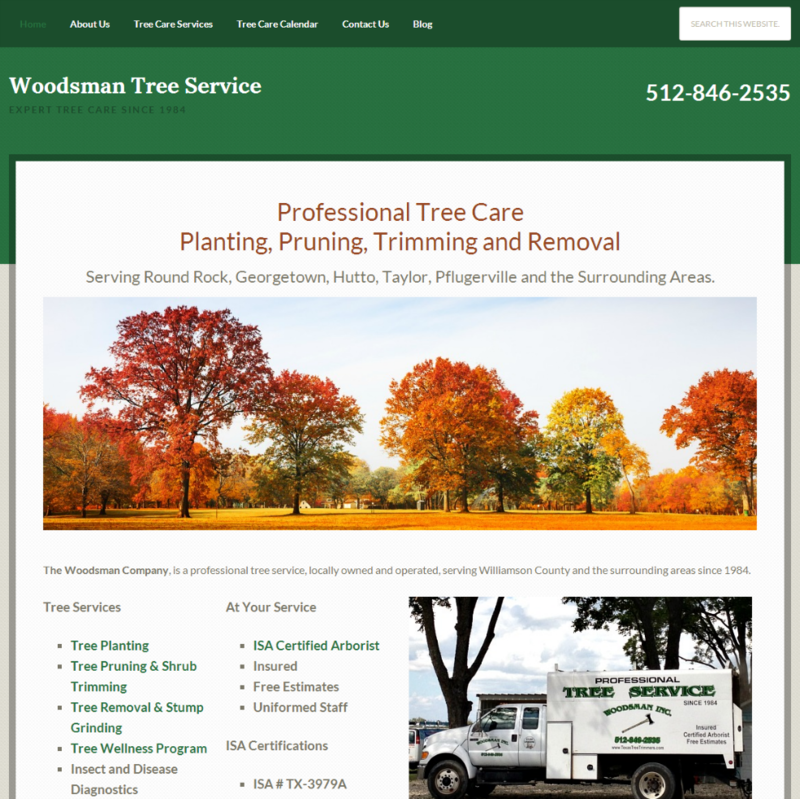 Visit their new site at http://www.texastreetrimmers.com/. 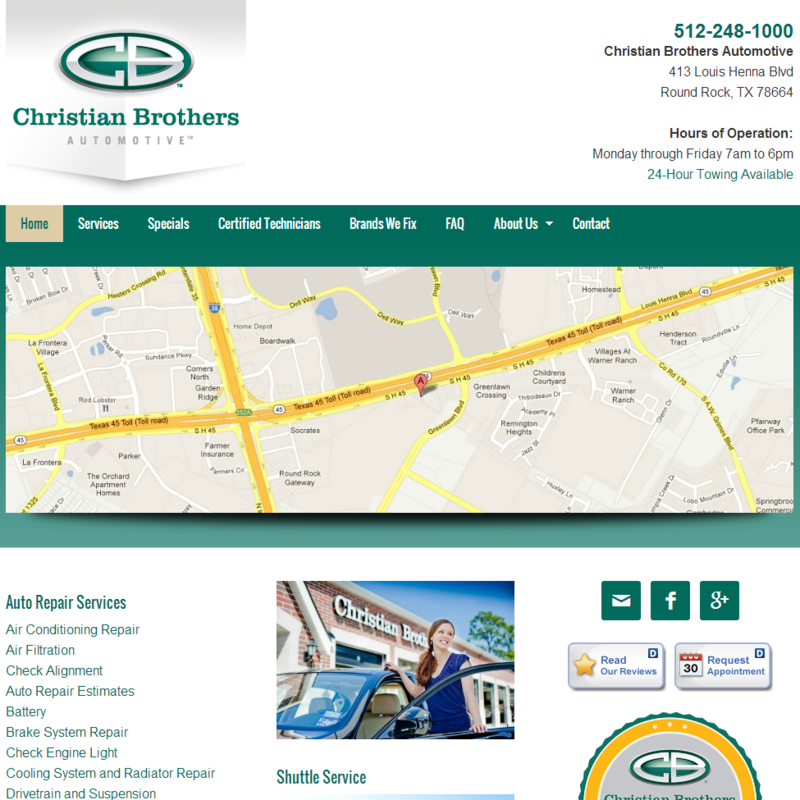 We recently built a new, mobile responsive website for Christian Brothers Automotive, an auto repair center in Cedar Park. Because it’s mobile responsive this website not only looks good on a desktop computer, it looks great on a tablet or smartphone too! One of the most important aspects of this website is that contact information be very prominent and show up at the top of the screen on mobile devices. Having all the contact information in the header ensures that the phone number is in the most prominent position when viewed on a mobile device. After all, more people are searching from their mobile phones than ever before. In addition to the contact information being prominently displayed, the phone number is set up so you can tap to call and be instantly connected to the shop during normal business hours. 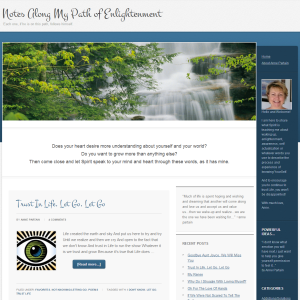 This site was built using the Legacy child theme and Genesis Framework. 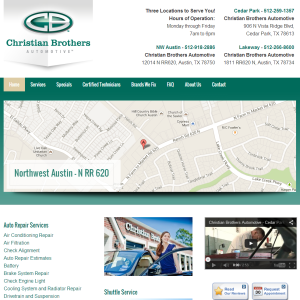 Visit the Christian Brother Automotive – Cedar Park site here. 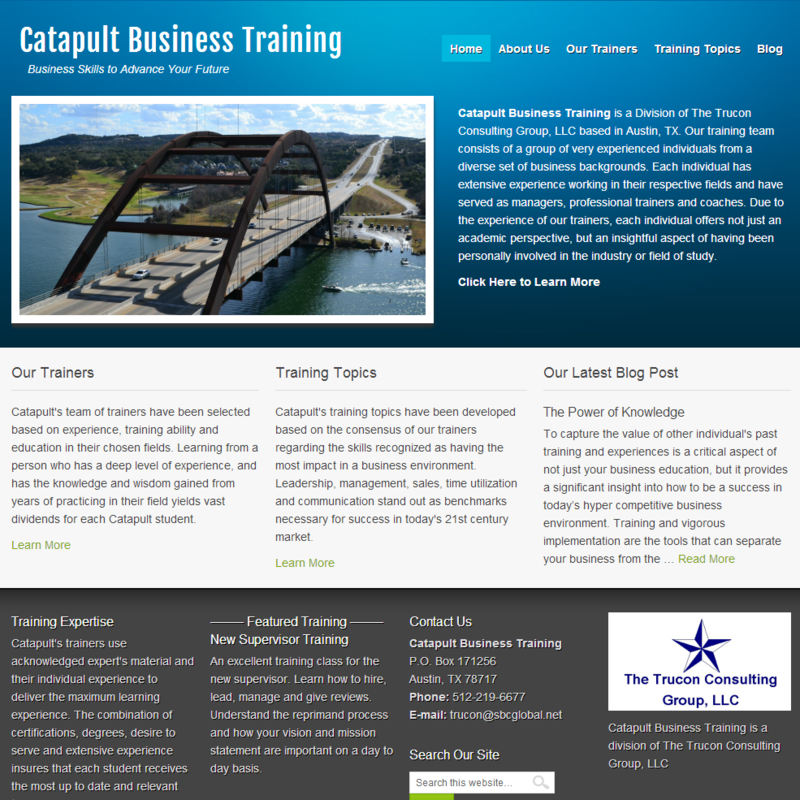 Catapult Business Training is a service of The Trucon Consulting Group out of Austin, Texas. Gary Seale, the Principal of Trucon, wanted us to build a new website to offer business training in different areas in association with several of his colleagues. This site was launched in July 2013 and uses the Metric Child Theme running on the Genesis framework. In addition to building the site we are implementing an online training program utilizing the MagicMembers Membership plugin and the . Visit the Catapult Business Training site. 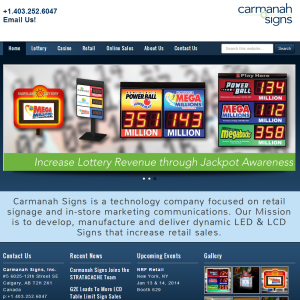 Last week we launched a brand new, mobile responsive website for one of the top LED Edge-lit Sign Manufacturers in the World, Carmanah Signs. We’ve been working with Carmanah Signs for the last couple of years on their SEO and it was time to upgrade the website. They serve three primary markets, Lotteries, Casinos and Retailers, and wanted a website that included many of the latest design techniques, including a large rotating slider on the home page and the mobile responsive capabilities. 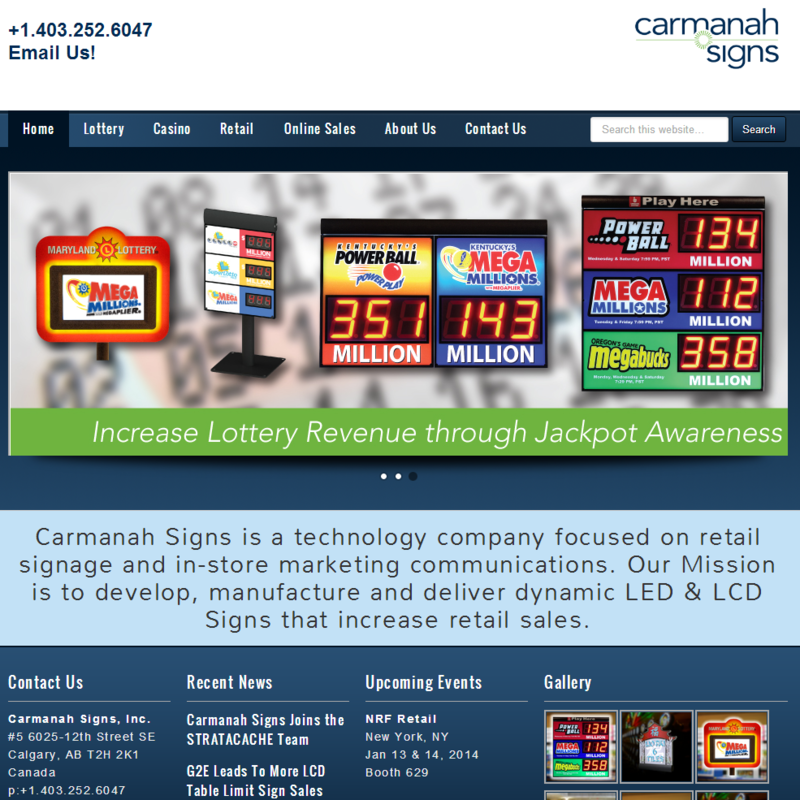 Please check out the new Carmanah Signs website. 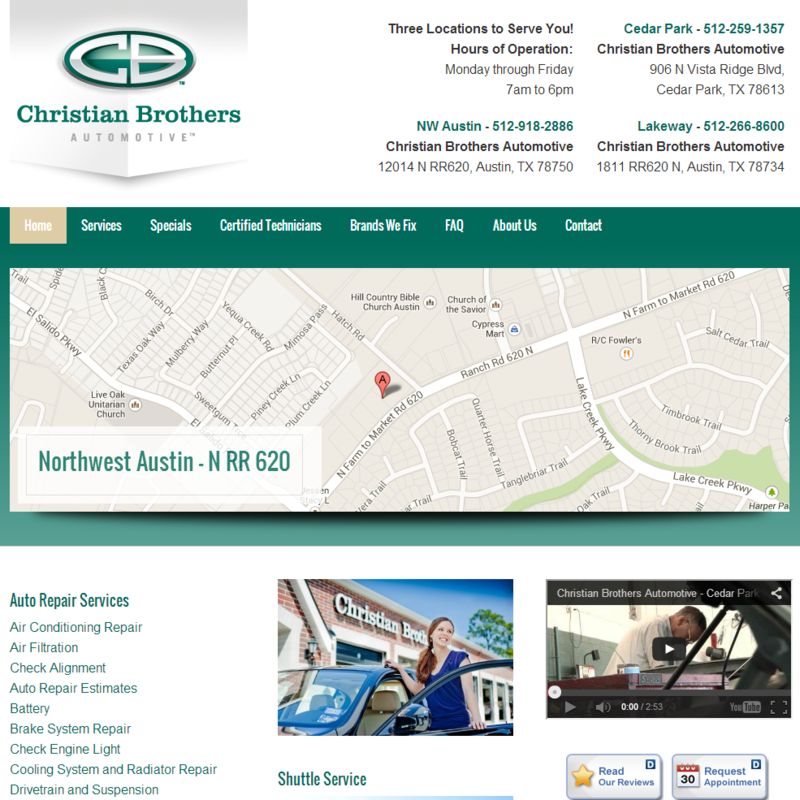 We had the pleasure of updating the website for Christian Brothers Automotive, an auto repair center in Round Rock. This website not only looks good on a desktop computer, it’s mobile responsive so it looks great on a tablet or smartphone too! The Christian Brothers Automotive location in Round Rock recently changed ownership so this site is no longer online. 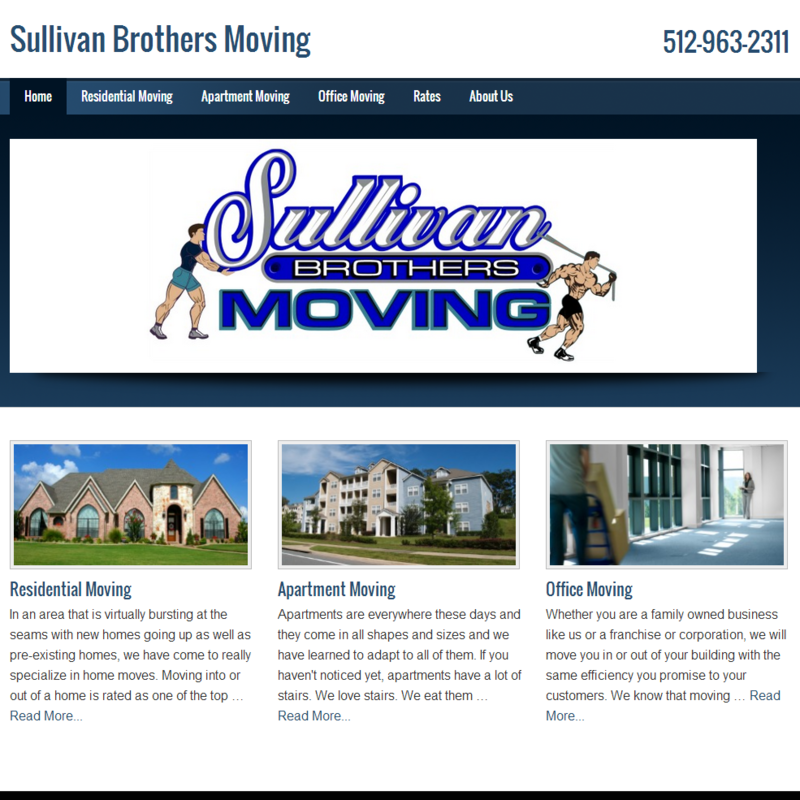 The Sullivan Brothers Moving website was built for Stephen Sullivan and his brother for their moving business. Stephen wanted a simple but effective website for promoting their moving services. This site was built using the Legacy child theme, built on the Genesis Framework. It is mobile-responsive so it looks great on any size device. Visit the Sullivan Brothers Moving site here. 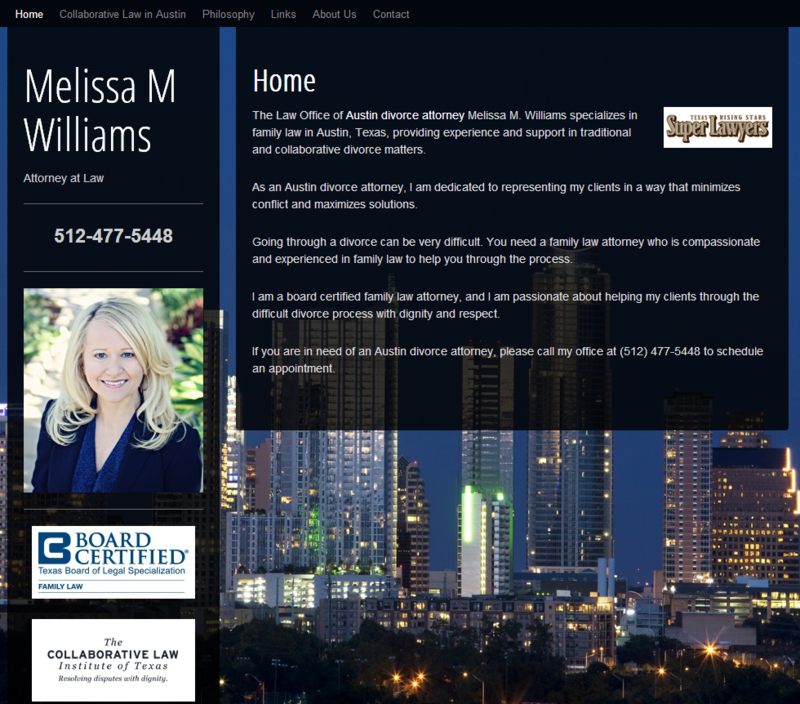 Melissa M. Williams, an Austin Divorce Attorney, contacted us in early 2013 to upgrade the look and feel of her website. The site was already running WordPress as the Content Management System so it made our job a little easier. Melissa’s site was launched in March 2013 and uses the Follow Me child theme from Appfinite, running on the Genesis framework. Visit Melissa M. Williams site here. In early 2012 we started working with the Texas State University Small Business Development Center on a training program called Online Mastery. As an extension of that program the SBDC wanted a website and blog of their own where they could profile their Business Advisors, share the success stories of companies they have worked with in the area and provide a calendar of upcoming training classes. Out of that came the Austin Small Business Answers website. This site was originally built using the Optimal child theme, which is a mobile responsive theme, running on the Genesis theme framework. The staff of the SBDC have changed the theme since we first developed the site. It is now running the Streamline child theme. 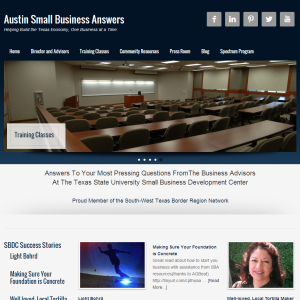 You can see the latest by visiting the Austin Small Business Answers website here.